Paul Stretch is a piece of open source software capable of extreme time stretching a piece of music. It creates amazing euphoric style music from the most mundane of pop. Here you’ll see samples and a howto to get your started stretching your own tracks. Thanks to Nasca Octavian Paul and some experimental 800% stretching of music tracks a new music genre is being born. Or that’s the buzz as I’m writing this. 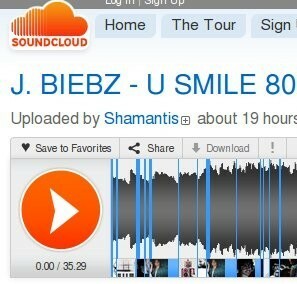 Alternate link for stretched Bieber song originally on SoundCloud. Paul Stretch software itself is solely for extreme stretching of audio tracks, it adds some smoothing algorithms to turn what would otherwise be lumpy mess into what can be a most amazingly euphoric sounding seascape of musical symphony. Sometimes verging on cacophony but overall sounding like a back drop of long echoing female-vocal calls with synth like cymbals and crashing waves Justin Bieber’s “U Smile” at 800%. You can try it at SoundCloud where this 35minute track is being featured. Download the software from SourceForge and run it on MS Windows or compile it yourself for Linux, run your favourite track through at up to 1,000,000,000 (1 billion) times elongation. You can run the compiled binary file under win32 just download and extract it from http://sourceforge.net/…/paulstretch_win32-2.0.zip/download. Yes it works with WINE on Linux based distros, at least it did for me on Kubuntu 10.04. Indeed I’d recommend running it this way unless you’re prepared to get your hands dirty in code getting it compiled for yourself. Not recommended. I’ve had a quick go, I’m out of practice but it’s certainly going to be more than the old configure-make-install mantra that I grew to know so well under Slackware all those years ago. 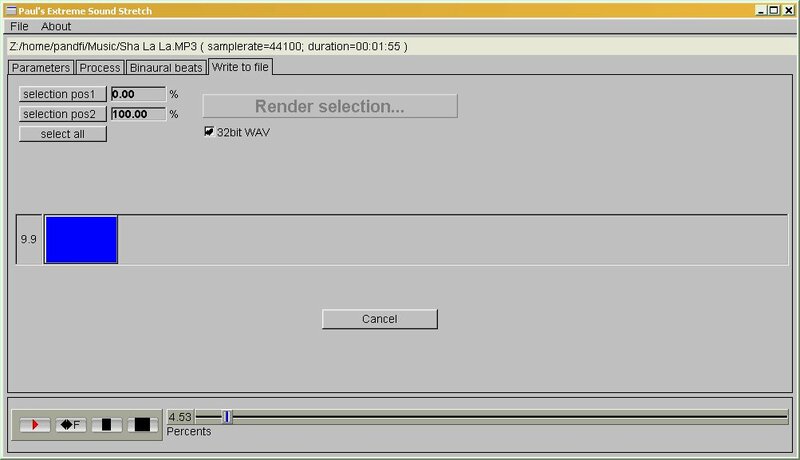 This is an experimental program for extreme stretching the audio. This algorithm/program is suitable only for extreme stretching the audio. – on sharp attacks to make the window smaller and larger on steady sounds. This avoid adding constant sidebands on steady sounds and smoothing too much the sharp sounds. If you’re as good at this as me then it won’t work. But you know, all the best! It looks a bit clunky but the basic effect is obvious – choose File > Open from the menubar. Then select the track you wish to stretch, I tried Billie Piper’s “Walk of Life” chosen for having short changing notes at the start and not having a heavy beat or long intro – I think MP3 or WAV input should work. This Billie Piper worked really well (first 5 mins of stretched track on SoundCloud). You can actually then just click the play button at the bottom right. Don’t be fooled it took about 20s for it to start playing my track. To output your track ignore everything else in the interface apart from the last tab, select the “Write to file” tab and then click “Render selection…”. This opens a file save dialog that you can enter the output file name and type – my options were Ogg or WAV but it apparently does MP3 too. There are many options and things are not terribly obvious nor are they apparently documented but this should get you started. I leave those with a bit more time to fill in the details about the filter and effects alterations and the variations in encoding and what have you. Just as an end note really. Remember that despite you modifying the original track beyond recognition that the artist, writer, composer, studio, etc., have copyrights in the material and you should ensure that you are properly licensed in your jurisdiction to use and/or distribute any music tracks whether they run in real-time or are stretched a billion times! Making derivative works like stretches is not an automatic right. Take care y’all. 17 Responses to "Stretch music tracks: awesome euphoric music with PaulStretch"
Then executing compile_linux_fftw.sh works flawlessly. Thanks for your comments, guess I’ve been too long on Ubu’ but now so long as it works I’m not too bothered if it’s through WINE or what, will update if/when I get chance to give it a go. Sweet!!! I’m having so much fun with this. Thank you for a great article. Hop you are going to do a follow up article with tips and the such. I cherished what you’ve got got performed here. The format is stylish, your written material elegant. Nonetheless, you’ve got obtained an edginess to what you will be supplying the next. Ill unquestionably arrive back once again yet once more for an excellent deal much much more in case you protect this up. Dont do away with hope if not at the same time many men and ladies see your imaginative and prescient vision, know you could have attained a fan appropriate the subsequent who beliefs what you could have received to say together with the way you’ve got presented by yourself. Very good on you! could someone please explain to me how to run Paul’s stretch? I’ve downloaded the .zip file, and in doesn’t have .exe, nor .dll in it.. so.. how do i run it? tnx. disregard that. i got it working! fantastic! thank you mr. Nasca! I can’t get it to work. I’ve got a song in there, and I selected a rate to stretch it at, and it worked for a second, but now it doesn’t produce any sound when I hit play. At all. I’m not just not being patient. It has been over five minutes and nothing. I’ve tried several times, too. Also could someone explain to me how we can determine how many times something has been slowed down? I keep reading that a song has been slowed down 8oox in articles, but I don’t see that type of number system in there anywhere, only a 151.81x looking thing. Can someone tell me how to interpret that?